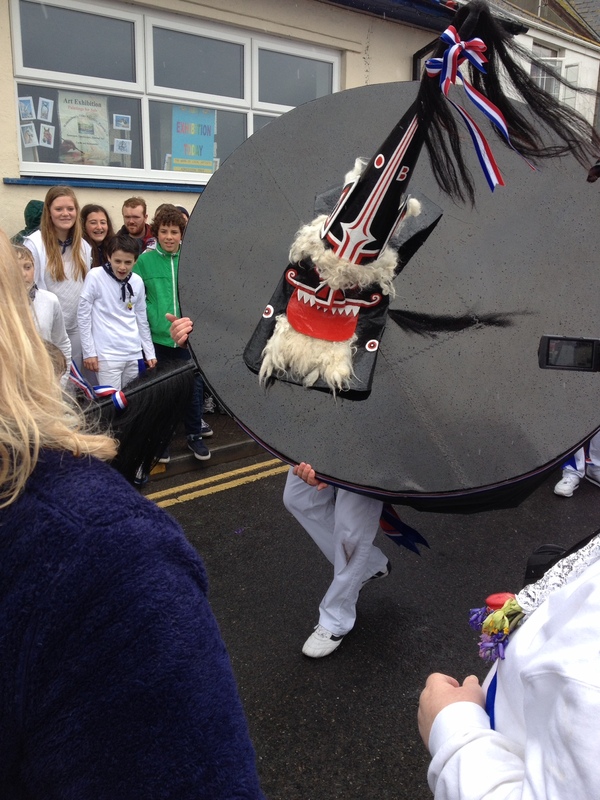 My holiday has happen to coincide with May Day in Padstow which is a local holiday to celebrate the ‘Obby ‘Oss. Its origins go back a long way and are associated with the arrival of summer and fertility. The town is decorated in sycamore leaves with a May Pole in the square. It is probably pagan in origins and seems to have escaped the clutches of the church in making it a Christian festival, as happened with many others such as Christmas. I have to admit the town does start to party from the night before and I am sure that as I type this blog there are many people in Padstow who will be decidedly ‘worse for wear’ (drunk). These May Day celebrations are enjoyed by many near and far as the draw of the tradition, the music and the local culture is very addictive! As my sister says, you don’t need to be there very long….but you need to be there. Interesting to read about Padstow and lovely to watch the parade. I am seeing double on Padstow or is it just me? !